While we were constructing the robot, the people at OMNI were preparing for their television show, OMNI-The World Tomorrow. 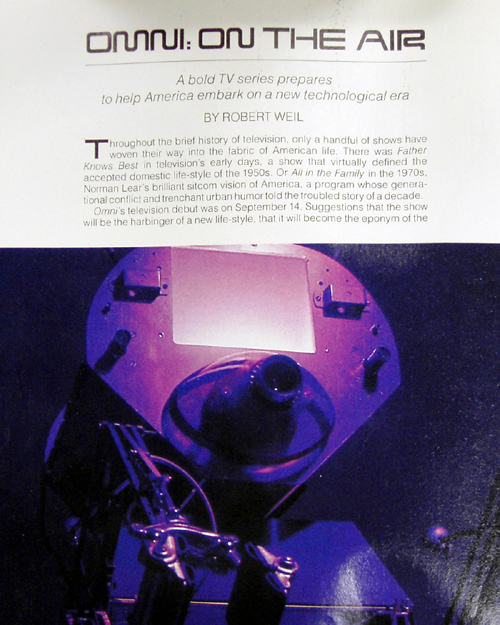 Omnivor would make up a large part of the first episode, and the robot would be used at TV trade conventions to sell the TV series. 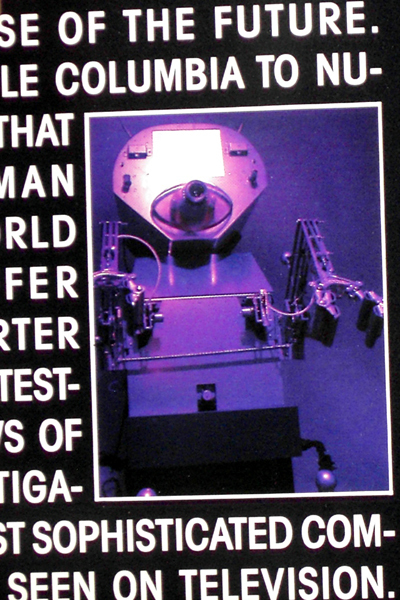 They started their advertising way before the robot had been finished.Note that Omnivor on the right image doesn't even have its display installed. The Promo video for the program was shot in my house in Ithaca. The first problem was, how to get the robot from our factory (a garage we rented in downtown Ithaca) to my house. My partner's family operated the ambulance service in Ithaca and the door clearance on the ambulances were high enough for the robot. So, one evening, an ambulance rolled up to the front door, a board was placed from the ambulance to the top of the front steps, and a robot rolled out and into the house. We saw the neighbors peeking out through their windows. A day or two later, the film crew and the actress playing opposite Omnivor arrived from the city. I will not mention her name (to spare her embarrassment), but she is now a network entertainment news comentator. She was not at all comfortable with Omnivor as the leading, um, creature. The promo film had a plot: Lisa was on her very first computer date (of course, her date turns out to be a computer). She walks upto the door, knocks, and the door opens. Omnivor rolls out. Lisa says, "Omnivor?". Omnivor says, "You must be Lisa. Please come in." Omnivor could be taught scripts. The robot, using voice recognition, would respond to spoken cues. When Lisa said, "Omnivor", the robot would say its line then roll back to let Lisa into the house. When they were filming the sequence, I suddenly remembered I'd programmed the roll back instruction, but NOT the stop instruction. Omnivor had sensors in front to detect obstructions, but not in back. Omnivor weighed over 200 pounds and it could have done serious damage to itself and the wall of the living room. So, I ran out to throw the robot's emergency stop switch. I triped, fell, and from the floor while being pushed back by the robot, tried feeling around for the switch. The director shouted CUT, but the cameraman said 'no way' and continued filming. It's a great outtake. I did manage to throw the switch. Then I needed time to reprogram the robot. Then came the second problem; If Omnivor is awake (not in sleep mode, where it responds only to the phrase 'Wake up, Omnivor') and if no one has talked to it for sixty seconds, the robot automatically entered random sentence mode. Omnivor had a large number of sentence structures stored in memory, as well as a large vocabulary of nouns, verbs, adverbs, and adjectives. In random sentence mode, OV would randomly choose a structure and fill the blanks with the appropriate word types. Unlike most of OV's capabilities, there was absolutely no A.I. involved in this mode--but people would hang on the robot's every word. 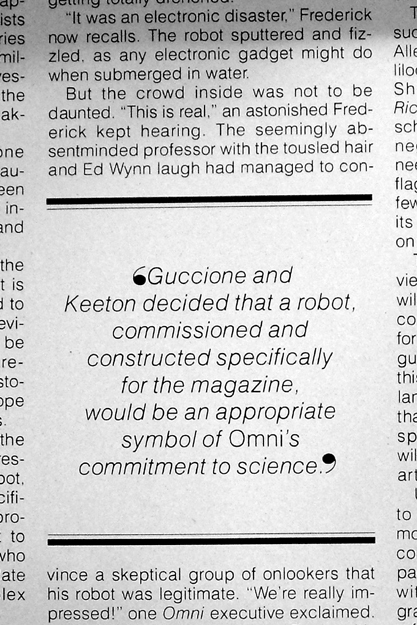 Some of the resultant sentences were truly amazing (we had to purge the robot's vocabulary of any reference to OMNI, Bob Guccioni, or anyone else involved with the OMNI organization). 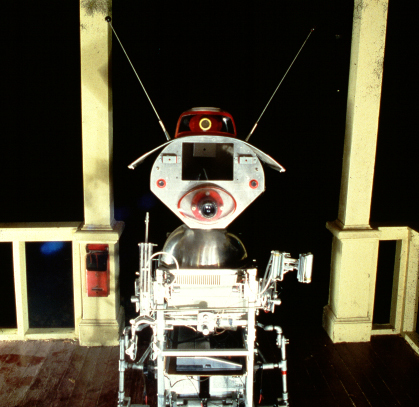 When someone spoke to the robot, OV would use its phase sensitive stereo ears to 'look' at the speaker. But, due to a programming error, this feature stayed active when OV was talking as well. Omnivor would try to find the source of the sound (which it couldn't do as the speakers made the sound appear to come from the robot itself). The robot, when speaking, was sort of like a small kid; it's head would wander randomly from side to side. This actually began a second or so before the robot began to speak (the sound board made a noise before emitting speech). So then, Lisa was standing near the robot. The robot entered random sentence mode, looked her straight in the eye, and said, "Get lost, cheap thing." The film crew went into hysterics and Lisa went off in a huff. It took almost a quarter hour to convince her that the robot didn't mean it, and an additional period of time to convince her that nobody had put us up to it. Finally, we had a good take. The robot rolled back, stopped, then raised an arm (which had been below camera level). The arm contained a paper cup of water. The robot (as it had been instructed) said, "Would you care for a drink?" Lisa said, "Yes, please, Omnivor." At that point the robot would release the cup as Lisa took it. But another programming error caused OV to, instead of releasing the cup, squeeze the cup, crumpling it and spilling water everywhere. The director decided to keep that bit in. Eventually, we got a good take. But the numerous out-takes were really funny. 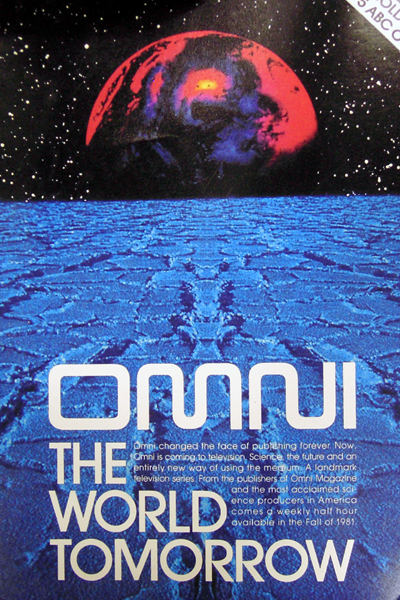 An article about Omnivor and the TV series appeared in OMNI magazine. The TV series was not well received, and folded quickly. But, during its run, I got to work with Ben Bova and Isaac Asimov (Omnivor could recite the laws of robotics on command). Honestly though, although I regret the closing of OMNI, a terrific magazine, I didn't regret the cancelling of Omni-The World Tomorrow. The TV series was almost embarrassingly bad.